United Food Bank in Mesa, works with over 200 partners and programs to help distribute food to the less fortunate in our community. All food is needed for food bank donations... but one of the most requested, yet least donated items is milk. Milk offers great nutrition to growing children but many families are only able to get about a gallon a year from food banks. Through the month of October, the Milk n More Store hosted a milk drive to support the hungry families that United Food Bank serves. The milk drive kicked off on October 3, during a ribbon cutting ceremony with the Tempe Chamber of Commerce. At the ceremony, Chamber CEO, Anne Gill, gave the first 10 gallons in honor the of #10GallonChallenge. Chamber members followed suit and over 100 gallons were donated at the ribbon cutting ceremony. Donations poured in by the gallon (see what we did there) for the rest of the month. Customers and employees were very generous and helped the Milk n More Store collect over 800 gallons of milk to donate to the United Food Bank. "Milk is one of the most highly-requested items by food banks, but it is rarely donated, leaving many families with limited access to the essential nutrients milk can provide," said Tyson Nansel, public and media relations director for United Food Bank. 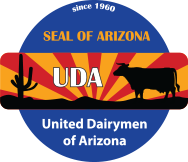 "We're extremely grateful to the United Dairymen of Arizona. This donation allows us to provide hundreds of gallons of milk to Arizonans in need." Thank you to the Tempe Chamber of Commerce, United Food Bank, and everyone who donated during the month. This milk drive was successful thanks to you! A special thank you must be given to our employees who donated 100 gallons or more. Those donations were above and beyond our hopes for what a single person would give.